2010. Pelican Publishing. Paperback. 347 pages. I do not get contacted about review copies frequently, and have accepted only a few of those. 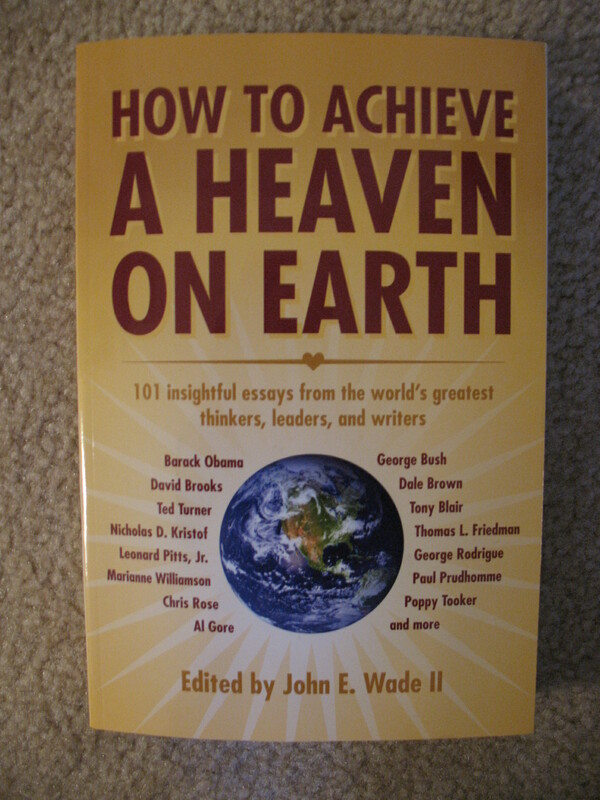 I was contacted about How to Achieve a Heaven on Earth last year. Motivational non-fiction is generally not a genre that attracts me, so I was on the fence about accepting the book. I decided to give it a try because in my experience of reading books of essays by a range of authors, there are usually some essays that will stand out and be worthwhile. For the benefit of those considering this book, I’ll speak more about the essay contributors’ backgrounds. Many contributors approach the question from a Christian perspective, and most from an American perspective. There is also a sizeable New Orleans / Louisiana contingent, not wholly surprising considering the editor and the publisher reside in Louisiana. In addition, quite a few of the authors have either founded or work extensively in non-profit organizations. There is nothing wrong with having those perspectives or backgrounds, but as the cover description does not go into detail about the selection, I wanted to let possible readers know more about the book’s scope. The book’s promotional email had accurately described the essays as being of a 1 to 3 page length, but I guess it had not registered fully until I started reading the book. True, the brevity of the essays makes this a good nightstand book: you can easily tuck in a couple of essays before you go to bed, for instance. However, I found that a couple of pages is really not enough space for the ambitious topics undertaken. There wasn’t enough depth for my tastes. There was very little said that was new to me and I had heard many of the arguments and positions before. In the last essay, republished from the New York Times, Lovenheim tries an experiment to get to know his neighbors better. He asks the people on his street for permission to spend the night at their house and “write about their lives from inside their own houses”. He published a book last year about that experience, and I’m rather curious about it now. That is the kind of writer / subject discovery I like to make with books of essays. Overall, unfortunately, the book was not a good fit for me. Book is by Winifred Watson. 1938, Persephone, Paperback, 234 pages. 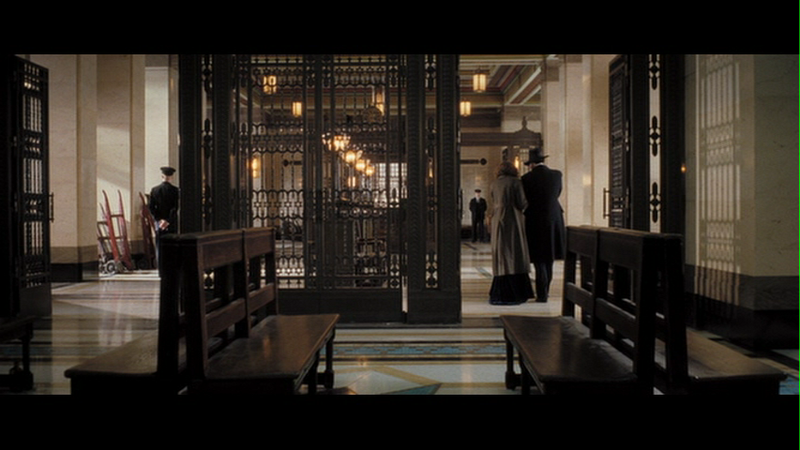 Movie: 2008 release, Directed by Bharat Nalluri, Screenplay by David Magee and Simon Beaufoy, Starring Amy Adams, Frances McDormand, Lee Pace, Ciaran Hinds, Shirley Henderson, and Mark Strong. In a nutshell: In both movie and film, the story is about a middle-aged governess who gets swept up in the life of a young London socialite for one day. 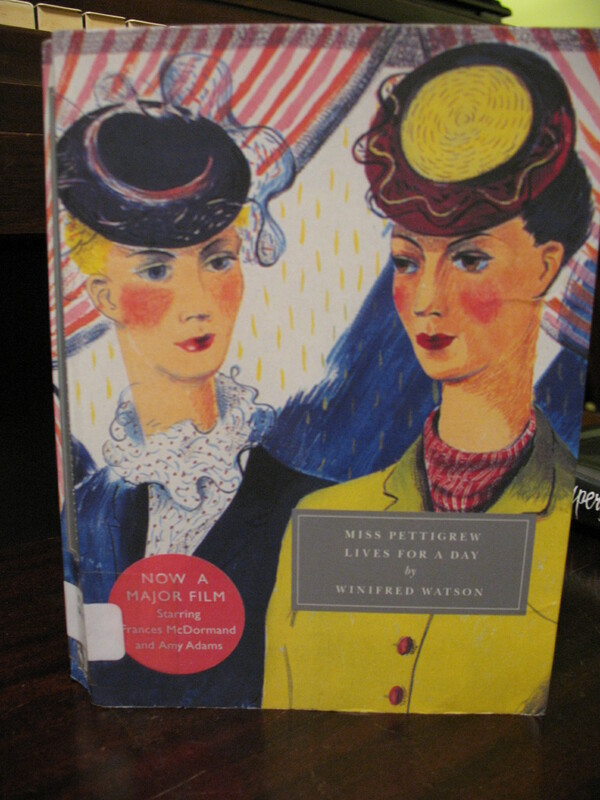 I saw Miss Pettigrew Lives for a Day when it was released in theaters. I had seen a preview and it looked fun and it featured Pushing Daisies‘ adorable lead actor, Lee Pace. My friend and I enjoyed the movie thoroughly and left the theater high-spirited and set on buying the DVD as soon as it came out. When it did, I showed it to friends and family, with the result that I have seen the film numerous times. Amazingly, though I would describe the film as ebullient and giddy, the book is even more carefree. In the book, Miss Pettigrew is quickly adopted by the confident, gorgeous Miss LaFosse and her social set. With a sort of ‘why not?’ air of abandonment, Miss Pettigrew adapts herself to her new friends’ lifestyle, allowing herself to be bolder, even flirtier. She adores Miss LaFosse unreservedly and champions the one suitor she thinks is worthy of her new friend. The film’s take on Miss Pettigrew is shaded a bit differently. Certainly Frances McDormand’s Miss Pettigrew undergoes transformation throughout the movie – becoming bolder and more confident, for example. There is a hilarious set piece in the beginning where she ably gets Miss LaFosse out of a jam. But film-version Miss Pettigrew is a bit more reserved and even disapproving than her gleeful literary counterpart. This might be because – in the film – Miss LaFosse and her friends are less happy-go-lucky and more deceptive and clueless. Winifred Watson certainly took some satiric jabs in the book, but on the whole, all except one major character, are treated with an amused benevolence in the book. Winifred Watson’s book was published in 1938. 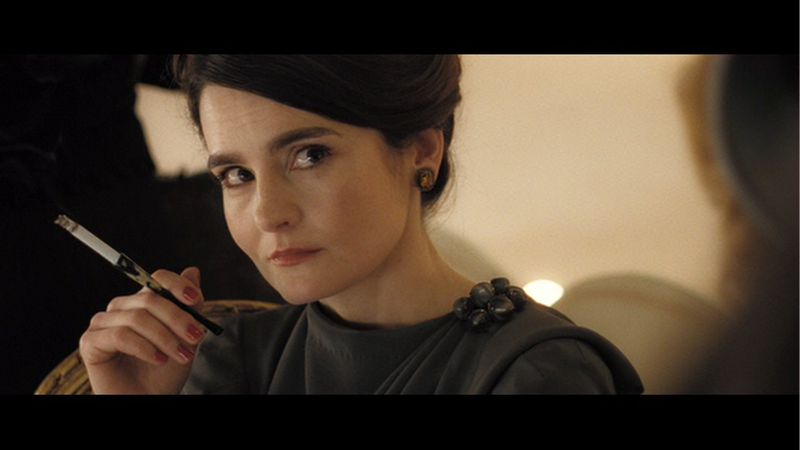 Watson did not write her story with a 21st century view of history and world events barely intrude on its romp. By contrast, the filmmakers probably looked at that year, and thought – bam! eve of World War II. I imagine when future screenwriters set films in our current era, there will have developed a certain shorthand for our time: if it’s set in 2011, we should have the people dress this way, and allude to this pop cultural phenomenon and that world event. I’m reminded of how Eudora Welty purposefully set her book Delta Wedding in 1923, a year where little happened, dodging great national events like the war and the Depression. As we look back on the past, years gather connotations about them, and thus old stories are layered with the new storytellers’ view of that time. The film is of course different from the book for many more reasons than just this one I have discussed. The heightening of stakes, the collapsing of characters, the molding of the story into more familiar narrative arc patterns – these happen in the adaptation too. But the above were some of more prominent thoughts swirling in my head. I enjoyed both film and book. 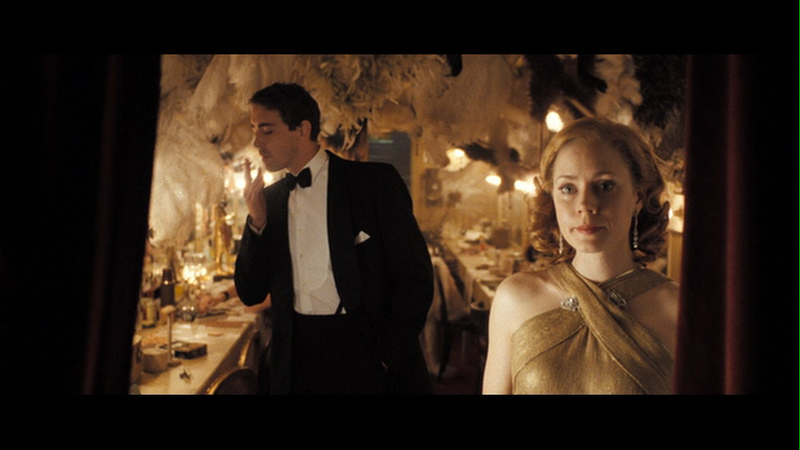 I find the film’s emphasis on the difference between the generations to be a nice touch, and I love when Amy Adams and Lee Pace sing together near the end of the film at the night club. The film also expands on Miss Pettigrew’s tentative romance with Joe Blumfield, which I like as well. On the other hand, I slightly prefer the increased poise and confidence of the book’s Miss LaFosse over Amy Adams’ more desperate version in Miss Pettigrew Lives for a Day. The scene where Miss Pettigrew gets a bit drunk in the book is a missed moment for the film. And it is kind of a shame that Miss Dubarry’s enterprising character is villainized for the film, as I rather liked the interaction she had with Miss Pettigrew in the book. I think I would recommend seeing the film first and book second, based on reactions I’ve read from other bloggers regarding the book and film. For photo credit, click on photo. In commute-related news, some of you may have heard about the winter storm that wreaked havoc on the Washington D.C. traffic this past Wednesday evening. Yeah, I was in that mess. What should have been an hour-long commute turned into eight and half excruciating hours stuck in my car. Most of that was spent with my car in park on the Beltway. I had a book with me but was far too keyed up to read it. I called people, listened to the radio reports, and devoured an apple that I luckily had leftover in my lunch bag. I saw lightning a number of times, as well as cars and trucks abandoned or spun out on the road. At 12:45 am, I finally made it home – exhausted and upset – but safe. So that is some of what is going on in my life. I hope to have some more reviews up in the next few days, so keep a look-out! 2003. Villard. Hardcover. 187 pages. Dumas’ Laughing Without An Accent caught my attention in the travel writing section of my library. Scanning that book, I saw that her memoir Funny in Farsi was written first and so I picked up that one and read it instead. 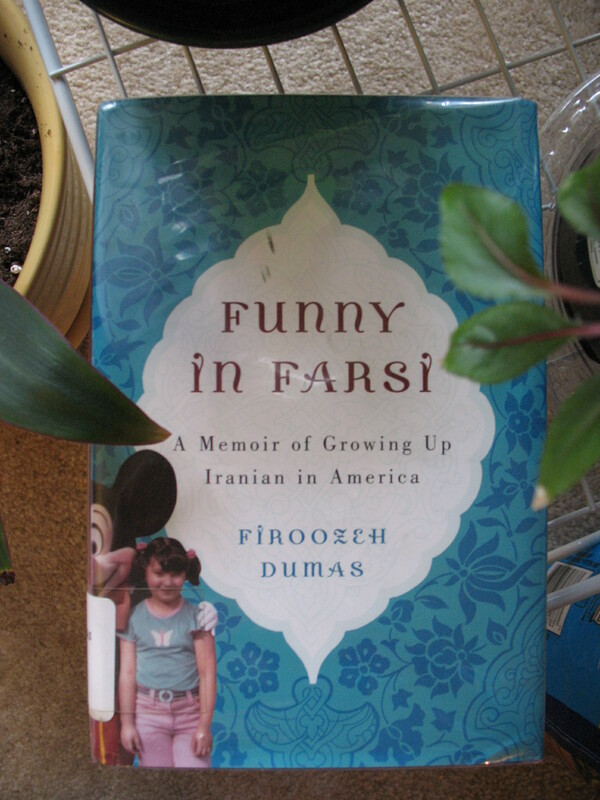 Funny in Farsi consists of short autobiographical essays – from accounts of Firoozeh’s childhood as an Iranian-American living in California to stories from after her marriage to her French husband. Funny in Farsi certainly has its merits, which I will describe a little further down, but I found it suffered from a “telling not showing” writing style, especially at the end of the essays. These endings made me think of a parody video online called “Trailer for Every Oscar-Winning Trailer Ever” (I think bookshelves of doom pointed me to it months ago.) At the end of this fake trailer, one of the actors says, “Explicitly stating the moral of the story and awkwardly working in the movie title.” This is basically what Dumas does with most of her essays: she either over-explains the emotional significance an event or conversation, or she drops in a somewhat clunky punchline to finish the essay. Often I found myself wishing she had just let the remembered events speak for themselves and let the poignancy or humor fall more subtly on the reader. I just like how, in that sentence, she concisely captures the nature of this lost opportunity for connection between Americans and the Iranian newcomers. Although Dumas uses her essays to point out the discrimination that she and her family have faced because of their ethnicity, she keeps an overall light and good-humored tone. One of the funniest moments for me occurred in her essay, “Save Me, Mickey.” In it, Dumas recounts the story of how she got lost in Disneyland as a child. While waiting for her parents at the ‘lost children’ way-station, another child is brought in screaming and crying. He cannot speak English, and the staff illogically think that because little Firoozeh is also from another country, she should automatically be able to communicate with the boy. I think some of the best essays involve Dumas’ adult life, including her traditional Persian wedding, a bizarre Caribbean vacation (“Judges Paid Off”), and a story involving an earthquake, bundt cake and a china set from her mother-in-law (“I Feel the Earth Move Under My Feet”). Because Funny in Farsi was just an okay reading experience for me, I’m not sure if I’ll get around to reading Laughing Without An Accent anytime soon, but if you’ve read it, let me know what you thought of it. It’s my first Library Loot of the new year! I feel like my reading in this beginning of the year has been only so-so. I haven’t had any books yet that have truly enveloped me. I’m hoping this new batch of books will invigorate my reading. And I have picked up one of them – Connie Willis’ To Say Nothing of the Dog – and was really loving it and laughing at its wit, when I remembered that the book was an homage to Three Men in a Boat, which I haven’t read. Yesterday, I downloaded the audio book from my library (my branch didn’t have a physical copy – I checked), but I don’t have an iPod, so I can only listen to it on my c0mputer, which is not my usual setting for audio books. (Audio books are for when I’m driving.) So I’m feeling kind of stymied. I want to continue reading To Say Nothing of the Dog, but I feel like I’d be missing a whole layer of reading experience if I don’t read Three Men in a Boat first. Gah! Maybe I’ll shelve the Willis book for now, request a physical copy of Three Men in a Boat from my library system, and start on one of these other intriguing books first. 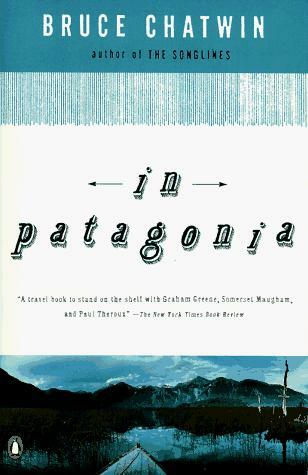 In Patagonia by Bruce Chatwin – I mentioned that I planned to read more travel writing this year, and Vishy recommended Chatwin and this book, which was published in 1977. 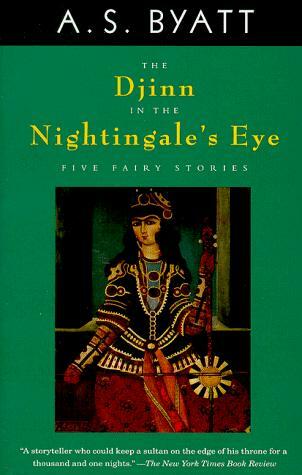 The Djinn in the Nightingale’s Eye: Five Fairy Stories by A.S. Byatt – Eva of A Striped Armchair recommended this book as a good introduction to Byatt. 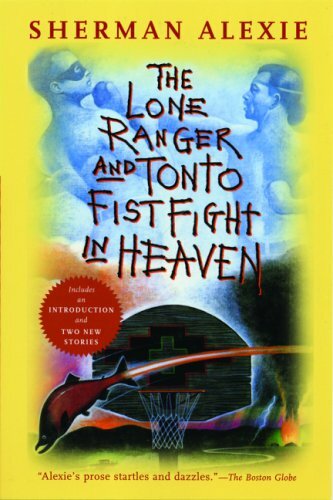 The Lone Ranger and Tonto Fistfight in Heaven by Sherman Alexie – Similar to Byatt, I’ve heard good things about this author (and this book), but haven’t read anything by him yet. 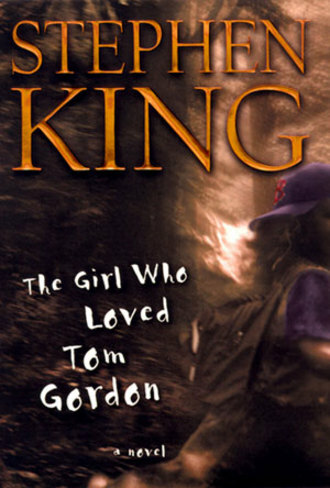 The Girl Who Loved Tom Gordon by Stephen King – Yet another author whose work I have never read! Jenny and Teresa from Shelf Love did an excellent post recently to convince non-horror readers to try Stephen King. I picked the one about an 11-year-old girl lost on the Appalachian Trail. It was short which was a big factor for being picked in this library loot, because the next book is much chunkier . . . 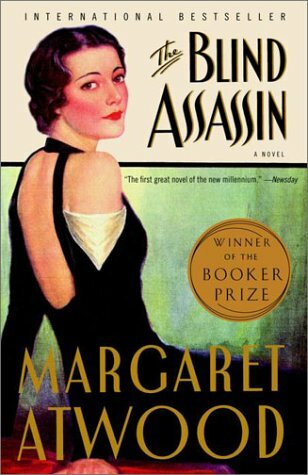 The Blind Assassin by Margaret Atwood – She of A Book Blog. Period, recently did a nice review of this book that worked as an effective pitch for me to pick it up. In an apparent theme of my library loot, this will also be my first Atwood book, not counting an aborted attempt to read The Handmaid’s Tale in college, when I just truly didn’t have time for free reading. 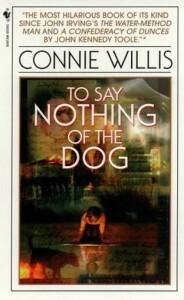 To Say Nothing of the Dog by Connie Willis – Which I mentioned before, and which is also my first book of Willis’. 2010. Dial Press. Hardcover. 269 pages. Heard about on: Omnivoracious, the blog by Amazon’s book editors. The Imperfectionists is a collection of interlinked stories set primarily in Rome, the headquarters of a small English-language newspaper. As the paper faces its likely closure, the stories show the personal travails of its staff, from the obituary writer to the copy editor to the chief financial officer. Rachman’s writing has a nimble quality to it that I admired right away. I want to use words like economical and efficient, but fear that makes the book sound terse and workmanlike, which is not what I mean. 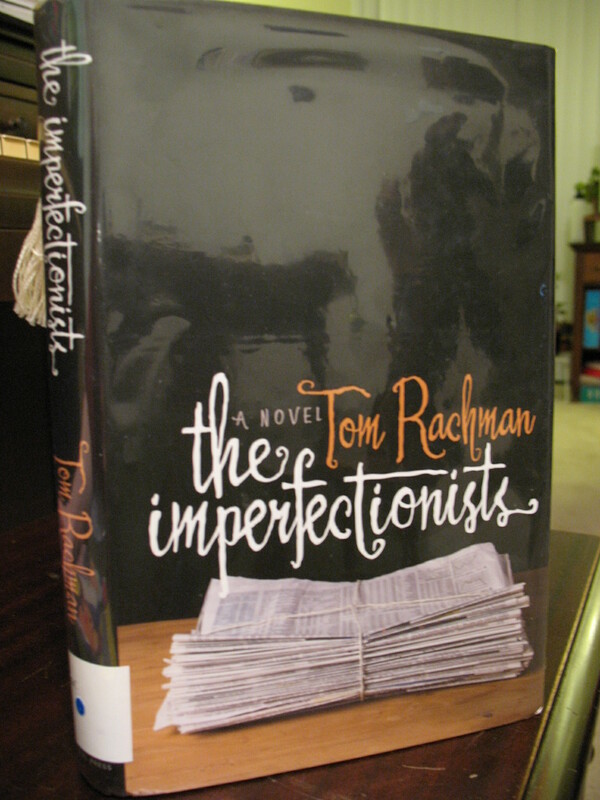 Rachman worked as a news writer and editor before writing this book. I think I have a penchant for writers who have been trained as journalists. Whether journalism provides the experience to sense where the story lies, and to pick just the right details for color and atmosphere, I can only speculate. Obviously, I enjoy authors who do not have a journalist background, but I suspect it’s most often the journalists’ style which makes me think – “I wish I could write like that.” I’ll have to keep a watch out in the future to see if my hypothesis proves correct. The characters of The Imperfectionists all seem to be contemplating or teetering on the edge of failure in some way, just like the paper which employs them. It might be failure in romantic relationships or career failure, but it seems to hover near them. When friends ask about her life in Rome, she says, “It’s fine, it’s good,” then is out of words. She does not admit that the apartment is magnificent, the neighborhood ideal, and Menzies an endearing mess. She does not speak of the pleasure she takes in tidying him, nor that she hasn’t snapped a single photo in earnest since coming to Rome, that she has no desire to, that she doesn’t care about grants or galleries anymore, if indeed she ever did. Above all, she will not admit that she is happy. The quiet notes of contentment in the Corrections Editor’s story and reconciliation in the Editor-in-Chief’s story were the high points in the novel for me. They made it easier to bear the later humiliation of one unaware character at the end of her story and a cruel act in the final story. As much as I enjoyed the writing and fine moments in the book, I feel like I should be more enthusiastic about the book than I am. I read it quickly due to an impending library due date, but managed not to read it hurriedly. Still, it subsequently seems like a blip in my reading life. In any case, I do think I will keep an eye out for Rachman in the future. This was his debut novel. Click on image for photo credit. 2010. Little, Brown. Hardcover. 159 pages. My family celebrated this past Christmas at my Uncle Ed’s home in north central Iowa. For many years, my uncle worked at a national wildlife refuge and as children, we were delighted by his ability to make squirrel calls. Squirrels and my Uncle Ed are completely linked in my mind. With this sort of introduction, not only I, but the whole family was now very curious about this petite book. My brother-in-law, David, had heard the titular story read by Sedaris on NPR and proceeded to read it aloud while we were finishing up one of Uncle Ed’s delicious meals. When I laid down the book between my own readings of it, I saw at least one other person pick it up for themselves. In many of the stories, the worst of human behavior is satirized by creatures as diverse as barnyard fowl, bears, storks and dogs. Although I didn’t care much for Flannery O’Connor when I read her in college, I’m reminded about what she said about her writing: she magnifies evil in her stories to make its grotesque nature more apparent to desensitized readers. 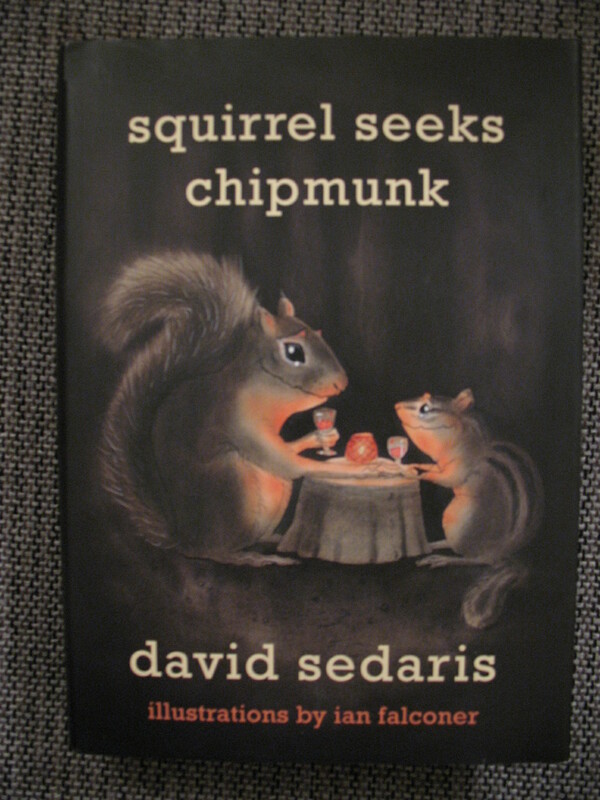 I think Sedaris does something similar with Squirrel Meets Chipmunk, with a biting humor that keeps the satire lively and engaging despite its dark outlook. Sedaris keeps the three most hopeful fables toward the end, which was a wise move. The singing leeches in the last story were particularly hilarious. I’ve been told that Sedaris is more entertaining to listen to than to read. There seems to be a quality in these stories that lend them to be read aloud as well. After reading “The Vigilant Rabbit,” my favorite story in the collection, I promptly started reading it to my younger sister. Before I knew it, others had drifted closer from other parts of the house to listen. When I reached the priceless, perfect last line, the rest of the house burst into laughter and we repeated it to each other with glee.